It goes without saying that this blog has been stalled for some time while I have had my hands full with work and kids. I have had the AAR for the Battle of Olbernhau (see previous post) mostly completed for some time, but it has been languishing forgotten in the limbo of the "drafts" file. In the effort to re-start things in motion around here, the first order of business is to publish it! 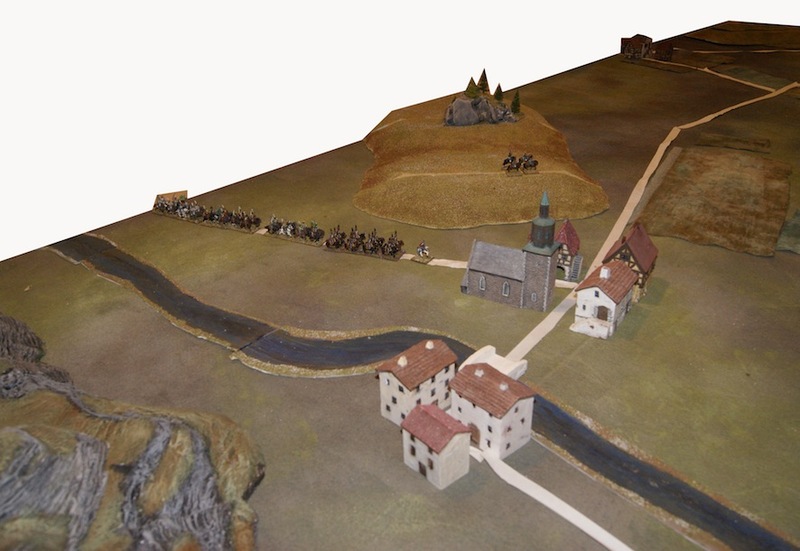 As outlined in the previous post (here), our scenario revolved a hypothetical encounter of the French IX Corps and the Allied Army of Bohemia just west of the town of Olbernhau, southern Saxony, in August 1813. The battle game is preceded by the approach of the town by Count Pahlen III’s Russian hussar division, moving in from the south. 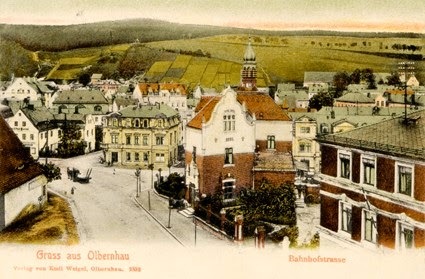 Olbernhau, a mining and metal-working town, is of strategic importance in this scenario as it sits like a cork in a bottle on a secondary route between inner Saxony and Bohemia, between broad and flat valleys leading northwest toward Marienberg and much narrower passes that climb past cliffs and gorges before falling, once again, to the south and eventually to the city of Chomutov. As well, the town of Olbernhau marks the location of a couple of bridges over the Flöhe river which flows north toward Dresden. As a cross-roads, Olbernhau is an inevitable objective in this scenario for both the Allies and the French who wish, respectively, to gain access to Marienberg and inner Saxony, or to deny such access to the other. As a prelude to the encounter, Count Pahlen and the Russian hussar division arrives, approaching the town in road column from the south. Barclay de Tolly will arrive as well, as the commander of the Allied reinforcements. 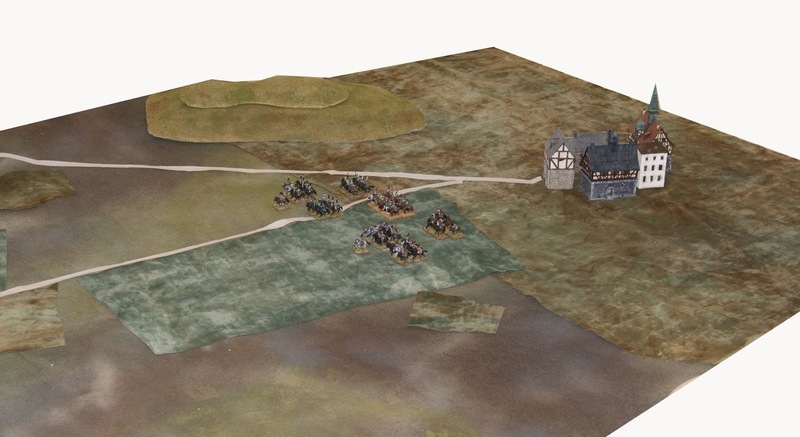 Count Phalen's Hussar division approaches Olbernhau from the south (middle right). The village of Ansbach is at the extreme upper right (west). The foreslopes of the Erzgebirge mountains are seen to the left (west) with the village of Neuschönburg on the west bank of the river. 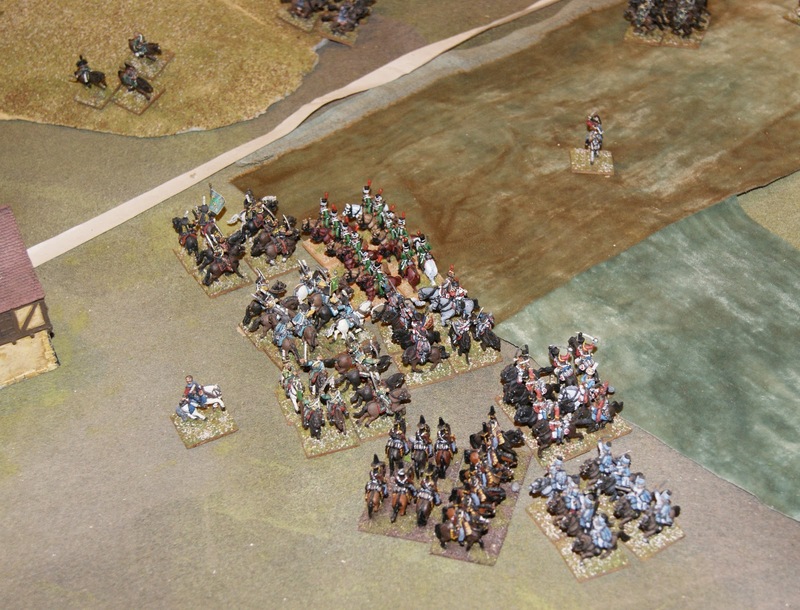 The hussars pass quickly through town and send a French light cavalry patrol (not shown) galloping hard to the west to warn GdD Lorge and the French force of the Russian arrival. Alerted to each other’s presence, the two antagonists must now deploy and formulate a plan of action. The French were in fact belatedly forewarned of the possible presence of the Allied advance guard and are already moving toward Olbernhau. Once the Russians were spotted, the Gen. Lorge, and his brigade commanders formulated a simple plan to engage them: On attaque, d’abord! They advanced with haste so as to catch the Russians, and any units following on, in their deployment area west of the town. Using their weight of numbers, the French could pin and destroy the Allies forces in detail before they could effectively deploy, or at least stall their advance past Olbernhau. Realizing that his side would start the encounter at a numerical disadvantage, FmL Prohaska’s plan (the Allied commander in chief here) was to maneuver his cavalry to the north, toward an adjacent and more constricted valley. There, they might turn and force a fight on a narrower frontage with a flank protected by a forested slope. He would thereby draw the French away from the deployment area and expose their rear to reinforcements (hopefully) arriving in due time. In turn 3, the Russians had some good fortune. On the first roll for reinforcements, the Cossack division was successfully summoned. They arrived on the table in turn 4 but would remain far from the fight for a few turns thereafter while they maneuvered into the battlefield. The Russian hussars still had to make do on their own. 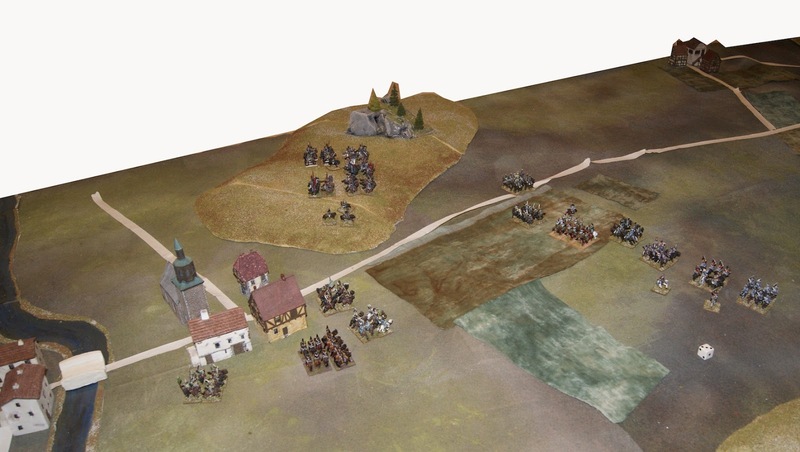 Turn 2:The Russian hussars (centre, just to the left of the town) are all deployed and attempt to run for the valley at the left of the photo. The french have closed with them and an attack is imminent. The Hussars wheel to meet the French. 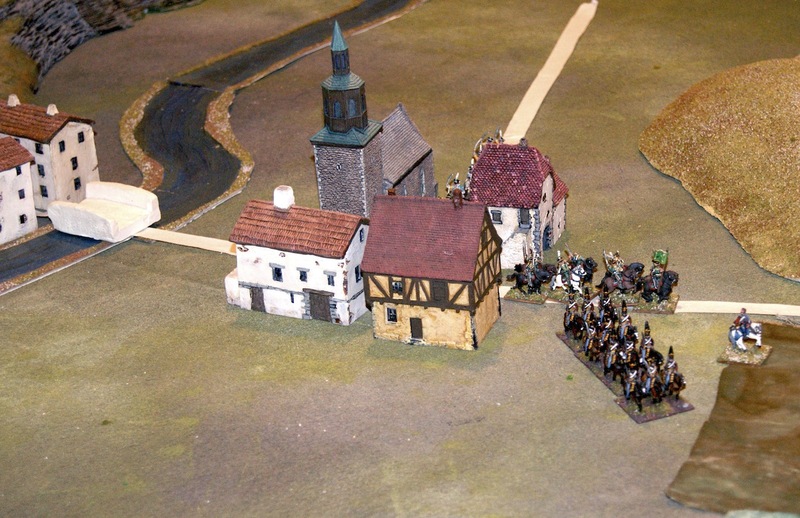 South of Olbernhau (right), the Cossack division arrives on the table in road column. The French advance turned out to be surprisingly rapid. Count Pahlen concluded that his dash to the north was going to be cut off and that he needed to wheel his cavalry in time to face the French on the plain just northwest of Olbernhau, or be caught unready. The Russians turned in time to be able to squarely face the French. The French advanced in a loose arc, attempting to envelope the Russians. Their advance brought them into initial contact with two units on the Russian left flank. The remaining Russian regiments made a counter charge on three units of the French centre. A sixth French regiment was maneuvered for an eventual flank attack or to be well placed to pounce on any defeated or recalled Russian units. A nasty plan intended to crack the Russian division more quickly! The seventh French unit, the over-sized 22e CàC unit, was held back as a reserve. With a successful initial charge and survive breakthrough, the large unit would be well placed to cover for regiments recovering in place and survive counterattacks. All sides being Morale Rating 4 units, no one had an advantage in this initial combat other than that of brute numbers. Nevertheless, the Russians did very well. In the critical encounter in the centre (outnumbered 2 to 3), the Russians managed to win all the combats based on a couple of fortunate dice rolls. The French centre was completely driven back with losses, while the Russians managed to saw off the two combats on their left flank, and suffered only the lightest possible losses in doing so. The Russians suddenly found themselves in an excellent situation as the defeated French units fled back behind the 22e CàC. Only one (!) of the five defeated French cavalry units rallied so the 22e's role as reserve was now essential. The Russians gained the initiative and managed to charge the 22e CàC with two hussar units. If the Russians could defeat the 22e, they would be able to conduct breakthrough charges on the French units defeated the previous turn. Unrallied and disordered, these units were pretty much sitting ducks and once defeated, the Russians would then be on almost equal terms in the engagement. The Russians also attacked the isolated hussar unit attempting to the turn the Russian right flank. The double attack on the 22e CàC was disrupted by a support charge by the single other French unit that was still in command. As luck would have it, the single other French unit that was "in command" at this point was actually capable of intervening in the melée! Their die roll was weak, but they cut off the advantage of numbers the Russians held for this instant. This time it was the French who were victorious. The 22e was saved by the narrowest of margins, a +1 modifier on a tied die roll based on the fact that they were the larger unit! All the Russian attacks were rebuffed. Whose idea was it to give the French this big unit anyway…? Turn 4: the Russian counter-attack is thwarted! The French commander concluded the turn by recalling the hussar unit on the flanking mission, as it was now completely alone and in danger of being cut off and surrounded. Our adversaries' first clash was sharp and dramatic but rather bloodless for the number of units involved. The Russians had to fall back to the outskirts of Olbernhau and there they attempted to rally and recover their units (with little success). The French were pretty much in the same position as they were only able to rally one of their defeated regiments. The two armies were both paralysed for the moment, one would presume that the first charge had rendered several senior regimental officers hors du combat and that troopers were dispersed and slow to find their parent units in the post-battle confusion. 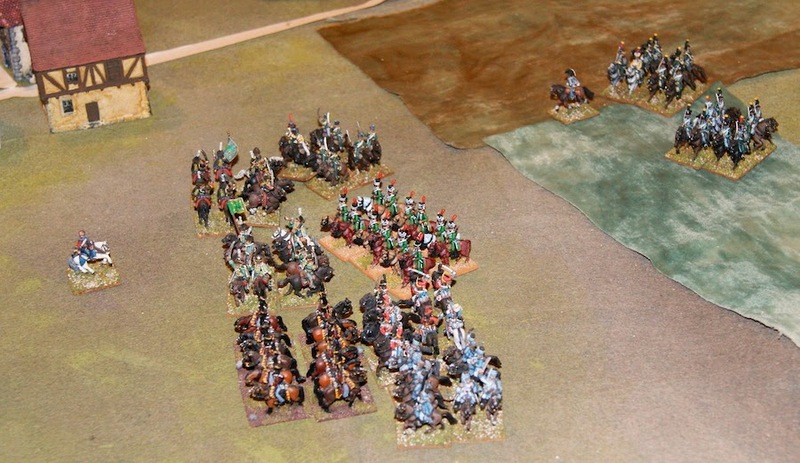 In the meantime, the Russian cossacks continued to move slowly up into the playing area. The Cossacks were in fact attempting to flank the French force by taking a wide route over the forested hill to the south of Olbernhau. The French were as yet unaware of their exact location as they were crossing forested hills and still out of direct sight. Both sides finally recovered the bulk of their forces and reformed during turn 6 and a new round of attacks was initiated in turn 7. Knowing that enemy reinforcements were inevitable, the French renewed their attack as best they could with only four of their seven units in action, the last three still refusing to rally after an number of missed morale rolls (some great Russian good luck here). The French advanced quickly to attack the leading two Russian units near Olbernhau, attempting to keep the battle away from their own "fall back" area, where their unrallied units dawdled helplessly. The Russians were obliged to commit their last unit in command into the melee as well; one unit on their side also remained unrallied. This second combat was both critical to the outcome of the battle and very evenly-matched. The combats of the Russian right and centre were resolved first and here the Russians were clear victors. Three French regiments in the centre were each beaten soundly, including one melee where the Russians were outnumbered two to one. One French hussar regiment (the grey-uniformed regiment in the centre) that had come out badly in the first combat, was mauled once again and broken outright. The Russians managed to draw the first real blood in the engagement, Brave and Gallant Lads! The combat on the Russian left, involving two Russian hussar regiments attacking the stalwart 22e CàC, was more complex. The advantage of size saved the 22e once again here, as the combat roll for both sides was tied but the French won with a +1 bonus for being the larger unit, the Russians were driven off with light losses. Things still looked good for the Russians however, as the two regiments of the Russian right, victorious this turn, had an optional break through move, and both were able to contact the 22e. The 22e was faced with a second two-on one attack in the same turn! This was a moment of high drama for the battle for, if the 22e was broken, all the French would be falling back or unrallied and there was nothing to stop the Russians from getting in among them like wolves in a hen house. The dice were rolled once again and once again they fell ever so narrowly in the favour of the French. The 22e was victorious once again and it was now the Russians who were entirely in a shambles! In the meantime, the Russian reinforcements were coming into play. The Cossack division was now beginning to emerge from the wooded hill on the south of the battlefield, somewhat behind the French flank. This must have been a nasty surprise to the French commander. By now their piquets would have reported some enemy troops in the woods but having these reports turning into the arrival of fully six Cossack units behind their flanks should have been enough to throw cold water on the French commander’s ardour. Also, after many failed rolls for further Allied reinforcements, the first Austrian infantry division was finally on the field, approaching Olbernhau from the south. Both the French and Russian regular cavalry sides were more or less paralyzed for a turn while they rallied defeated units and reformed once again. 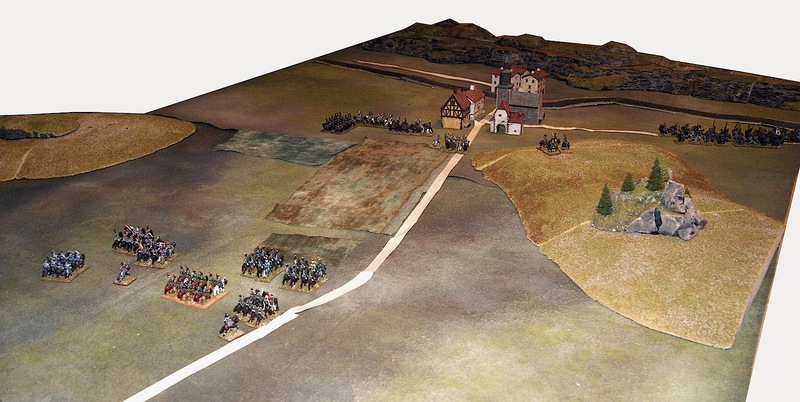 The Cossacks managed to reform and loose disorder markers, for the most part, on the edge of the open battlefield while the 22e CàC was held back by the French in order to face off any attack mounted by the Hussars to the front or the Cossacks to the rear. 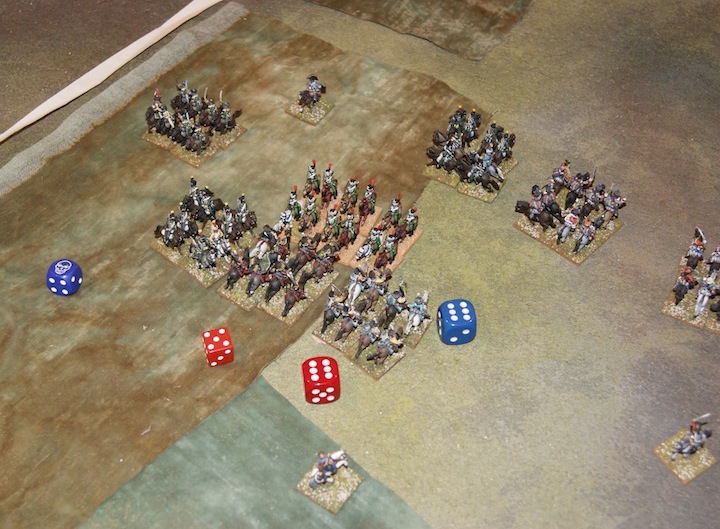 On the subsequent turn, the dice went in favour of the French, as two unrallied units in the French rear finally did rally, just in time to be able to turn and attack the Cossacks. One destroyed its target outright and the other lost a very close battle (one pip) due to being already badly. Both were recalled/fell back for recovery closer to the rest of the French force. 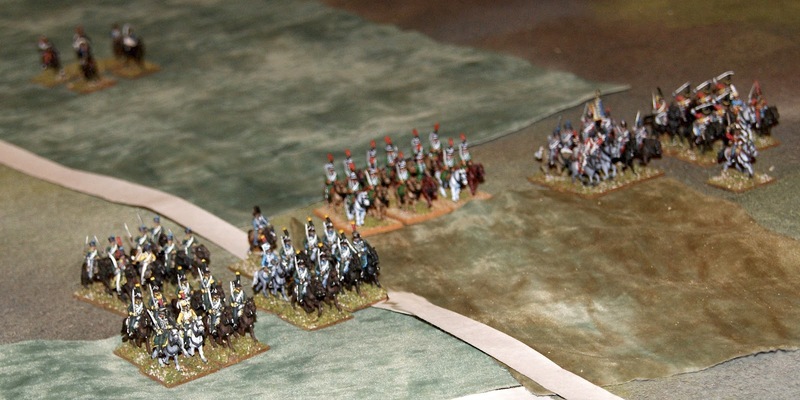 Meanwhile the rest of the French maneuvered for a third attack on the Russian regular cavalry, involving four units. This was a last-ditch effort to break the light cavalry division before the arrival of the Austrian reinforcements and before the Cossacks could cut off their line of retreat. The Russians were able to counter with only three units (the rest were unrallied) and this time exhausted and outmanned, the Russians lost across the board. Two units were broken while another was now in bad shape. The division’s remnants were now attempting to rally on the very edge of the river delimiting the eastern edge of the battlefield. The division was now badly shaken and, on a die roll, its orders shifted to “full retreat”. That is diplomatically saying that the division was finally routed! 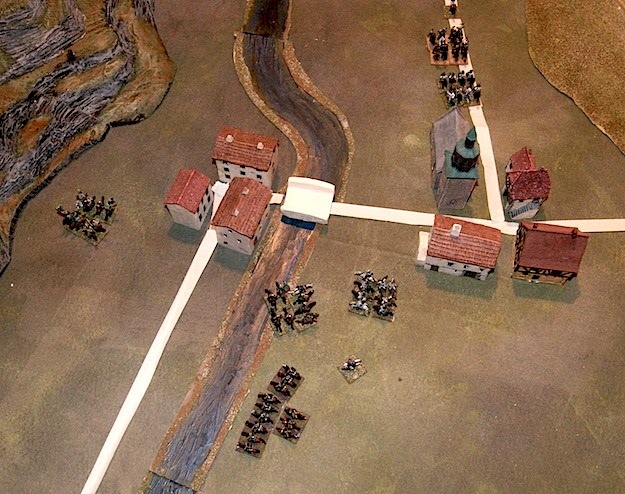 The French commander Gen. Lorge had brought his opponent to its knees and surely was surely tempted to continue a breakthrough move to finish off the helpless Russians. However, he was an experienced and cool-headed officer and realized that by pursuing he would blow his remaining good units, and allow the Austrian cavalry, now about to enter the battle field to his rear. His force was still essentially intact though badly beaten up and fragile, and unlikely to survive an encounter with fresh forces. He angrily threw his pipe toward the Russians and ordered his division to withdraw to the west, brushing off the Cossacks and leaving the field to the Austrians. Surely a there would be a citation in Le moniteur to come! The French at the end of the battle; the cavalry having attacked in two directions in turn 10, consolidates on the scene of the original cavalry battle (centre) and judiciously withdraws before the Austrians (arriving to the south (top left) contest their honour. Olbernhau and the remnants of the Russian hussars are at left, the Cossacks on their somewhat/possibly effective flanking mission are at right. Final Result of the battle of Olbernhau: French minor victory for Ge. Lorge (the Russian cavalry was broken but managed to hold on until reinforced, thus enabling the Austrians to gain the Olbernhau bridgehead in the end). French losses : 1 Hussar unit (the rest of the units were almost all badly worn). 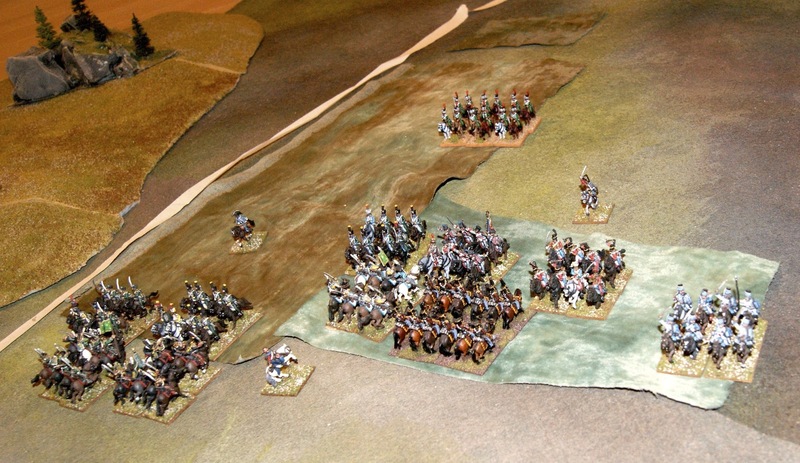 Russian losses : 2 Hussar units, 1 Cossack unit. 14 damage points allotted to the French, 15 to the Russians. Citation to the French 22e Chasseur à Cheval, who broke up the successful Russian attacks at the beginning of the battle (and perhaps saved the French side twice) and who acted as the rallying point for the French throughout the battle. 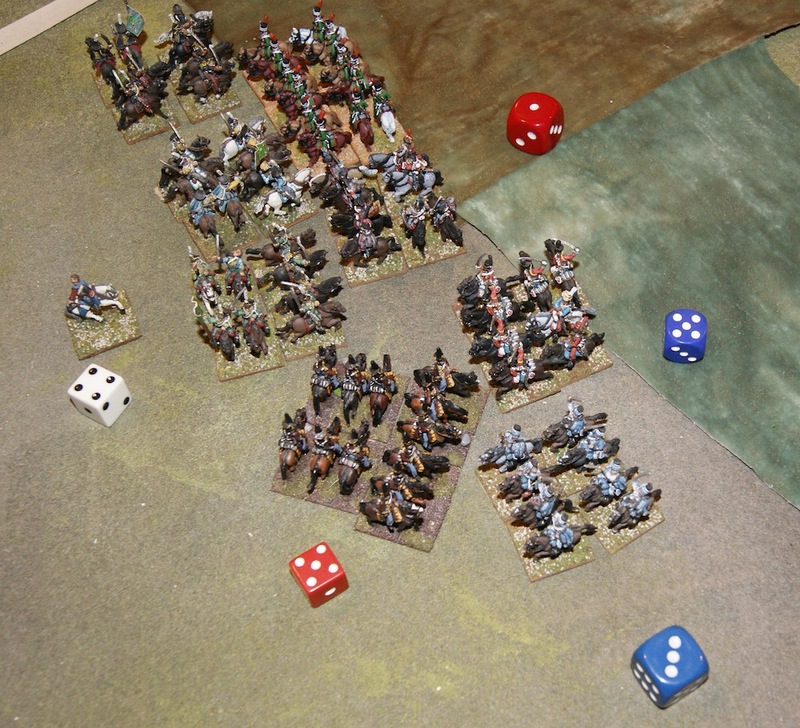 Plus, 1 Russian hussar unit broken at a cost of not a single point of damage to themselves! One can only admire Count Pahlen and the Russian hussars who held the field until reinforcements came and who held the possibility of imminent victory twice in his hands only to lose it, this was a heroic battle by them. Surely the Emperor will bestow a new title on the Count and honours upon the division. Good to see you back in the saddle. This engagement was stirring stuff! Bravo to both sides for a battle well fought. AJ! Great to hear from you too. How are things with the new abode? It was indeed a fun scenario as there was a lot of ebbs and flows, periods of mayhem and strange near-paralyses, as one might expect from a pure cavalry encounter with matched forces and so many units needing recovery/rallying after melees. The affair was always in the balance and the battle turned several times on the outcome of a die roll. The Russians nearly won against the odds. I recall thinking the Cossack's maneuver would be more effective, however. Not much came of that. Glad to hear from you again - it has been quite a while! Great little action - a see-saw fight. The Russians did astonishingly well (if lucky) and I daresay Gospodin Platen might well be receiving at the very least a 'mention in despatches'! Hi Archduke, many thanks for dropping in and for commenting, it has been awhile. Yes, the Russians were very much the recipients of some dice luck. Quite unrepeatable I'm sure. I'll edit the AAB to recognize the bravery of the entire Russian hussar division, as you suggest. I have updated my map for Syldavia, fiddling with minor details like the direction of river courses, the location of national frontiers and changing some place names. The most noticeable change is the presence of a hex grid, each hex is supposed to be 10km in diameter. This particular change is a big help (obviously!) figuring out distances between places in real terms, such as numbers of days (or hours...) of travel between point A and point B. Syldavia is smaller than I thought!